“Florida Permit” by Peter Corbin, acrylic on canvas, 20 x 30 inches, 1994. Published here courtesy of Peter Corbin and Shooter’s Hill Press. WHEN JOHN’S BUTLER Luis trotted in his white waistcoat across Simonton Street holding a cell phone aloft, William stopped the truck and lowered the window without a word. “El telephono, Capi,” Luis said. It was already 8:45. All the other guides had been on the water since sunup, eager to play the hand dealt them by the fine weather. The last thing William wanted to do was touch the brake. “Gracias, Luis.” John winked at William and slid the phone between the drawstrings of a leather pouch that was his boat bag. It had nothing in it, at least that William had ever noticed. John considered the bag, like most things, an article of faith and decorum. They drove out of the island’s center and up Roosevelt Boulevard and William watched the light breeze touching the water. No clouds. The condensation was gone from beneath the windshield. The palms waggled just a little. A line of traffic came in to town from across Cow Key Bridge. As they crossed the bridge William glanced at the incoming tide: just beginning to surge. He took the next right back toward the old outdoors movie theatre being reclaimed by mangroves. A few remaining pieces of the screen flopped in their steel frame like they had in any light southeast wind for the past 20 years. They followed brush-choked alley down to the ramp behind the bar, William backed the boat until the rims almost touched, and he and John got out. John dropped his bag in as William unhooked the safety chain and loosened the winch and the skiff slid into the water. Once on plane William remembered that John would do two things as they swept down Cow Key Channel on their way out: he would forget to put his sunglasses on, and he would shrink down on the seat as they passed under the low bridge. William pointed at his own eyes with thumb and forefinger and John nodded. The guide then stood up just before the bridge and the damp concrete rushed over his head a few feet away and seconds later they broke out into the shallow open water with the hull of the skiff just tapping at the wrinkled surface. Now William had to figure out where to go. It took a few seconds. William took his hands off of the wheel and tightened his cap ever so slightly. The skiff veered east. On the bad days, William trusted nothing. He’d let his eyes do their work, seizing on some moment of unfamiliarity and then letting go, but pushing his vision forward just the same. It was hard to stare into cold, dark water. He and John had had a long string of bad days. They hadn’t hooked a fish in two weeks of fishing. Today, they were running east for a change. William headed toward a flat on the gulf edge that lagged behind the ocean tides and would be just feeling the rush of incoming water. He wanted to fish it because John had never been there and he wanted John to see something new. They would look for permit. William angled the boat through the rivers of water behind the keys until they faced the open gulf but stopped short, measuring where he should start on the flat. He handed John his rod and pushed out over the grass. The fish would be sitting inside the horns of the flat where they touched the channels, facing the incoming sea. William started to look and kept his eyes fixed as he climbed onto the platform and started to pole. He soon saw a permit fall into place and pause to examine some possible bit of food here and there as he half-drifted, half-swam his way into shallow water in front of them. John made a good cast and dropped the fly down-sun and the fish swam over and ate it without hesitation. Suddenly the sunlight and the breeze felt remarkably good. “You got him, John. Well done.” The guide pushed after the fish. They netted the permit in silence. “Well, damn,” John said finally, as William retied the leader. William had begun fishing with John seven years earlier after John convinced him that he would not take his fishing too seriously and would be good company on the boat. This was important to William, because he knew John was not a good fly fisher from the way he talked about it and because William hadn’t taken a new client in years and remembered how hard it was to get rid of a bad one. John couldn’t cast a permit fly more than forty feet when they started together; that was with all the conditions being right. It took three years for John to catch his first permit. But John was damned good company: respectful, thoughtful, enthusiastic and curious. William liked that he wore a fedora, and before he even knew about John’s past he could tell that John was, as they said, his own man. He wouldn’t care about the stroking so many other wealthy clients expected. John liked to chant songs from the flamenco clubs near his ranch in southern Spain when fishing was slow, or the day was beautiful but quiet. John had never caught a good bonefish so he quickly put his rod away and stuck his hat in the cooler and they rode around Bad Cast Corner to the broken rubble of the Jewels. Over the past several days John’s gesture of storing his hat in the cooler offered a humorous interlude as they checked one spot after another, finding no fish. “Nothing like a cool hat,” he would say. They had poled not more than two hundred feet of the Jewels when John pointed with his rod and out of the corner of his mouth said, “Are those bonefish?” A school of bones had swum up beside them in the current and sat puffing at the bottom not thirty feet away. William had to force himself to look down to see them. “Do it,” he said evenly. William made one cast and hooked a large bonefish that made a terrified dash toward the mangroves. The rod tip bounced as the line began to snag some small shoots. But the fish kept zigzagging until he faced deeper water and then began a long straight run, pulling the long bow out of the fly line. A few minutes later William netted the fish. As William rocked the fish back and forth in the water he told John half-jokingly that he wasn’t going home until he caught a tarpon. “Betty,” John said into the phone without waiting, “I don’t know if you can hear me, but I think I’m going to be late.” He stared at the phone for another moment and then slid it back into the bag. “There. Let’s go fishing.” William ran the boat back into the basins and through the wheel ditch of the Middle Narrows with his left arm behind his back and wondering exactly where those fish would be on the three-mile-long edge where they would catch their tarpon. He saw a deep flat that was warm and dark enough to hold them in early March, lulling them to sleep in the current. The only thing worrying him was that the fish would be big. A half an hour later they shut down a on the north edge of the wide expanse of hard-coral bottom and drifted over an old car frame daubed with small sponges. Clouds of glass minnows streamed from the open windows like smoke from an oil fire. Henry began to sense what the tarpon would look like in this deep light: spectral shapes, dissolving and reforming out of shadows. Soon enough he was convinced he was seeing fish and he pointed out what to John looked like any other piece of bottom. John hooked five tarpon over the course of the next two hours, but each fish spit the fly after one jump. Every other shadow they cast to would rise into focus — some after a somersault to reverse direction — and inhale the fly. John would come tight but the fish were moving quickly and he wasn’t bowing fast enough or keeping control of his line. It started to feel hopeless, even vainglorious; most days, hooking any fish would be enough. William felt the moment escaping. He thought of John as a competent angler, but perhaps not up to the task; the pressure was testing him and he was quietly disintegrating in front of the fish. It didn’t help that all the fish were over 100 pounds, or that they seemed to come out of nowhere. They fished for another hour. Three more fish tried to eat the fly, but now John was pulling the fly out of their mouths. William saw how this was all going to end. He was feeling frayed from trying to help John focus and from keeping himself from overreacting. He’d been through this many times before. He was almost thankful when they ran out of fish. They sat in the boat quietly for several minutes. William’s mind churned. 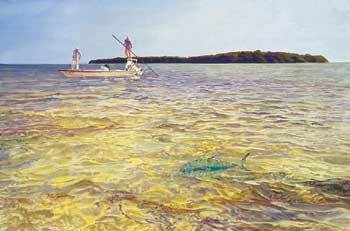 The options weren’t good; the tide was falling fast now and what tarpon were around were sinking into the channels. “Do you ever tie up at the Raw Bar?” John asked out of nowhere. They ran down through the sailboats in the harbor and idled toward the bar. William tied the boat off to the guano-white dock and eyed the tourists at the railing eating French fries and looking as though they were waiting for something to happen although they didn’t know quite what. If it was pleasure they were feeling it was vague and unidentified. William actually detested the whole scene. John drank his Bloody Mary slowly, and William could see that the pleasure he was deriving from the cold cocktail was not vague at all. John’s mind seemed to wander; he wasn’t having a hard time not thinking about fish. But William was sorting out his remaining cards, counting the minutes until John finished his drink. He looked at his watch: 3:43. They had just missed another good tide at a nearby flat. A belching tourist seemed to wake John from his reverie. William drank the rest of his tea quickly but as the ice rattled in his cup he heard John say, “I’ll have another one” to the passing waitress. We’re done, William thought. Twenty minutes later they were idling away. He knew of only one clear option on this last of the outgoing tide, and John would have to make some fairly long casts. He planed up the boat and ran west across the channel. As they started off, John yelled over the revving engine: “Whoever said alcohol was a depressant was full of $#@$.” Finally William felt like smiling again. William didn’t really expect the fish to be there, but minutes later a fish rolled, then another. He didn’t have to say anything to John. John was false-casting beautifully — as elegantly as William had ever seen him cast — and he released the line in a long tight loop. It landed right where William would have put it had he walked over and dropped it there himself. “Strip erratically, John.” William almost didn’t get the words out. A tarpon was airborne with John’s fly in his mouth and John bowed quickly and then line was flying off the reel. John looked in perfect control. The fish jumped, John bowed, and William guessed they might have to go after the fish, which was now down-current and in the channel proper. But it wasn’t a large fish — probably 25 pounds at most — and they stayed put. Minutes later the tarpon was at boat side and William was removing the hook and almost afraid to look up at John, but he could feel the man beaming. “Well. If you say so.” They both laughed. William stowed the rod and John sat down beside him and they started to idle toward home. William was about to put the boat up on plane, but glanced at John and stopped and pointed a finger to his head. John took off his fedora and put it in the cooler.